President, Prime Minister weigh in on Hadassah hospital strike as outrage continues to mushroom. The Hadassah hospital issue has trickled up the political chain Monday, as Prime Minister Binyamin Netanyahu and President Shimon Peres both responded to the ongoing strikes. "The hospital administration has failed on the large scale - and now Israeli citizens are forced to bear the cost of the bailout," Netanyahu stated, according to Channel 2. "We need to find a solution which balances the need to keep the hospital running and the need to prevent this crisis from returning within the next few years." Meanwhile, Channel 10 noted that President Shimon Peres also spoke Monday about the crisis, and called on the government to fix the situation as soon as possible. "I call on the government and the hospital administration to find a solution that will prevent harm for thousands of patients in and around Jerusalem," the President said during an event organized by Akim at the president's residence in Jerusalem. Akim is the The National Association for the Rehabilitation of Children and Adults with Intellectual Disabilities. "I know that when it comes to the patients you must work 24 hours and not let go until you find a solution to the crisis," Peres said. He urged the government and the hospital staff to move quickly to prevent any more damage to the patients, as well as to the hospital's reputation. 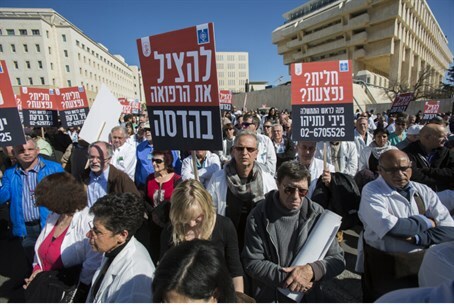 The remarks wee the latest development in the Hadassah Medical Center crisis, which has snowballed over the past week from a one-time strike to a highly publicized protest against the treatment of hospital workers in general. The budget cuts have been hurting patients, according to the staff, which is reeling after a month on half-pay. As a result, the centers closed their doors Tuesday, operating on the schedule normally reserved for Shabbat and holidays. Doctors and hospital staff have been leaving the hospital in droves as talks stall. The public's support has snowballed, as hundreds of medical centers across Israel went on strike in solidarity between 10 a.m. and 12 p.m. Sunday morning. Mass protests converged on the Prime Minister's Office Sunday afternoon and the Finance Ministry Monday morning over the issue.